Flatten rolls into 3-inch rounds on lightly floured surface. Top each with 1 teaspoon cream cheese and chopped turkey. Fold ends over top of filling and pinch to seal. Roll seam side down on unfloured surface into a smooth ball. Place on prepared pan; let rise about 30 minutes or until puffy. For topping, combine sesame seeds, poppy seeds, onion flakes, garlic flakes and salt in small bowl. 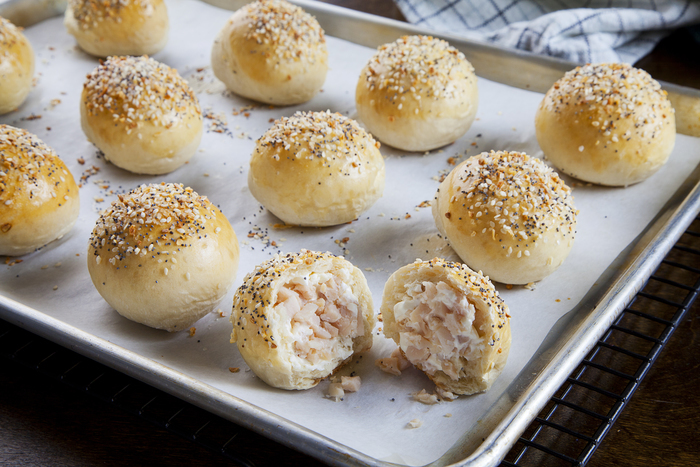 Brush egg over tops of rolls; sprinkle evenly with topping. Preheat oven to 350°F. Bake 15 minutes or until rolls are golden brown. Cool slightly on pan; serve warm with additional cream cheese and turkey.